I bought these buckets because I had heard from fellow detail nuts that dirt monsters from my wash mitt hide at the bottom of my wash buckets re-attaching themselves to my mitt when I dip back into my bucket. They then grind themselves into my paint like the sculptors who fashioned Mount Rushmore causing swirls and blemishes in my paint. BUT NOT ANYMORE! After unboxing these bad boys I instantly fell to my knees and wept tears of pure joy, and by "pure joy" I mean "pure Garry Deans infinite use detail juice". I filled these bad boys up with soap and water and began washing right away. Almost instantly (after a wash, clay, and polish of course) my car went from mediocre to a masterpiece. My neighbor, Charlie, he broke his neck when he drove by the house. When I finished, I wiped the Garry Deans detail juice from my face, I looked in my paints reflection, and thats when I saw him behind me. Mike Phillips. Standing with a Rupes Big Foot LHR15 Mark II in hand. He nodded once in affirmation of the vehicle that was before him. He then turned away fading into the background but not before turning around..and giving one more final glance like any normal car guy would. This is a great setup. 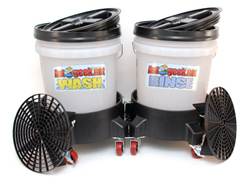 Both wash and rinse buckets attached together on wheels make this item a pure joy to use. This is an okay product. Really nothing more than a couple of 5 gallon buckets on a bucket dolly. You really can't tighten down the screws to hold it in place because the plastic is very thin. 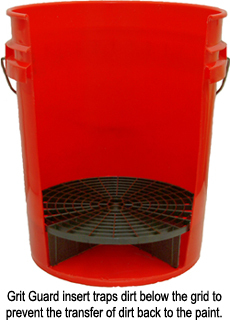 Good system to do the two bucket wash with grit guards. 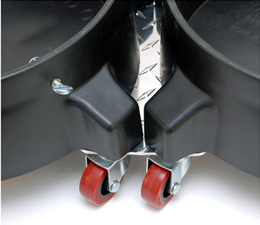 Reasonably well made and very nice to have the ability to tie both buckets together. Works well. My only dissappointment was not being allowed to order two different color bukets in this kit, to quickly identify wash from rinse. The only way to accomplish this would have been to order separately at a higher price. Not sure why this is not possible as the two buckets were shipped in two separate boxes. For this reason I gave a rating of 4, otherwise I would have rated it a 5. ConsNot being able to order two separate color buckets in the kit. Item is heavy duty, rolls well and fits together very well, I like the 2 bucket set up for washing.